Depth: Dig a hole twice as deep and twice as wide as the root system. Mound a small pile of soil in the center of the hole as a support for the rose's root crown. Be sure to keep the graft just above the soil line. Color: Red and white blooms are accented with yellow. Foliage: Deep green with dark new growth. 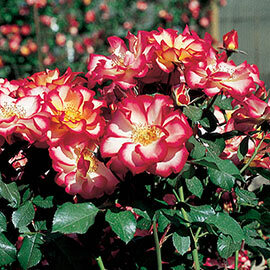 Flower Form: Large, 4-inch, grow in clusters, rounded, shrubby flowers. Soil Requirements: Well drained, humus-enriched soil. 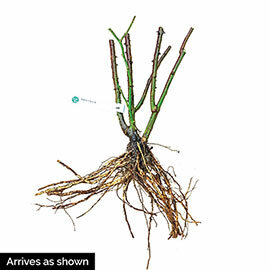 Pruning: Prune to maintain shape. Remove any dead or damaged branches. Petals drop and new blooms appear without pruning. Shape plants at any time.